strike a pose in the pressbox Saturday in Akron. While hundreds of fans poured into stadiums to witness some of the first performances of the 2013 Drum Corps International Tour this weekend, even more await DCI's "Tour Premiere" cinema event which will feature performances of all six of the drum corps present at the Innovations in Brass event, Saturday, June 22 in Akron, Ohio. The six corps, each one a 2012 World Championship Finalist, were met with resounding cheers from the audience in Akron, while behind the scenes a large production crew worked tirelessly to record the performances to be broadcast two days later, Monday, June 24, in more than 450 movie theaters across the country. "There is absolutely no substitute to being in the stands to witness this live," Barrie Zimmerman, the broadcast's production manager said. "But for people who can't be here, our job is to ensure that you get the best possible experience as a fan in the theater. So as you're sitting there, you're doing more than enjoying your popcorn. You're seeing the show the way it's meant to be shown, and you're getting some behind-the scenes features that you can't get in the stadium." 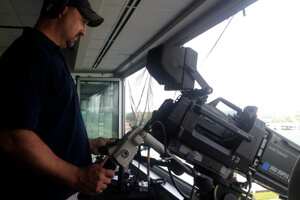 Although the broadcast takes place two days after the event in Akron, the production crew treats it as if it were a live broadcast, with highlights from other events and commentary added as taping continues. The crew must fit all performances and other content within a two-hour timeslot. same used for major collegiate and pro sporting events. "The scale of this production is very close, if not the same as many of the productions that you see in the Olympics," Art Leubke, the broadcast's stage manager said. "We've got the best equipment. It's all high definition. And those crisp pictures and the great sound don't just happen without really good people behind the camera that do all the controls." 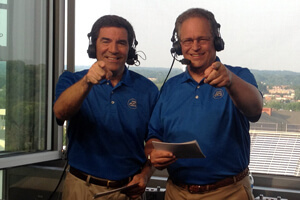 The "Tour Premiere" draws fans into theaters across the nation because it comes at an ideal time, according to 34-year DCI broadcast host Steve Rondinaro, who will be inducted into the DCI Hall of Fame this August. "There's all that pent up demand from the winter," Rondinaro said. "People are looking for their drum corps fix. And there's always the age-old question: Who's got what for this season? This is when you find that out. Plus in the stadium, they're withholding the scores, so the first time you're going to see those results is when you go to the theaters." "These shows are kind of special, and it's kind of different that we don't get to hear the scores after," Boston Crusaders Drum Major Stephen Grindel said. "But it really builds the anticipation." Not only does releasing the scores later give an added dimension to the Akron event, according to Rondinaro, but displaying the early-season performances to such a broad audience also changes the nature of off-season preparation for the drum corps. field prior to Phantom Regiment's performance. "It gives incentive to the staffs, as well as the corps, to be as complete and ready as they can be for the first week of the season," Rondinaro said. "When we first did this a few years ago, it caused a lot of hubbub around the corps, saying, 'Wow we've really got to accelerate our pace and be ready so that we can put our best foot forward on the big screen.'" DCI Hall of Fame member Dennis Delucia, who serves as a color commentator for DCI's cinema events, says that unlike the live broadcast of the World Championship Prelims (which will return to movie theaters for its 10th year on Thursday, Aug. 8), the broadcast's hosts do not have time to watch and discuss the corps' productions prior to being recorded for the "Tour Premiere." "Just like fans who are watching everybody for the first time in the theater or live here in the stadium, we're watching the corps for the first time," DeLucia said. "It's always a thrill to watch so many brilliant people designing shows and teaching, and so many amazing kids who give up their summers to perform. The level of proficiency and artistry that we see here is amazing." 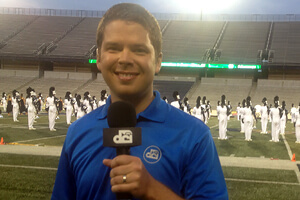 As the action on the field in Akron wrapped up and the production crew began tearing down equipment, many performers voiced their excitement for the 2013 DCI Tour getting underway. "For our second official show of the season, I was absolutely proud of the corps," Spirit of Atlanta Drum Major, Chelsea Kucejko said. "The energy was definitely there and the crowd response was incredible." Drum Corps International will return to cinemas nationwide on Monday, June 24 at 6:30 p.m. local time, when the third-annual "DCI Tour Premiere" showcases the season-opening performances of the Bluecoats, Boston Crusaders, Cadets, Cavaliers, Phantom Regiment and Spirit of Atlanta. This one-night event will be shown in more than 450 cinemas across the country. Visit FathomEvents.com for a complete list of participating venues and to order tickets.